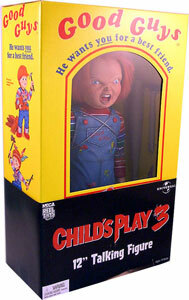 Description Of Item: Based on his classic Child?s Play appearance Chucky comes complete with voodoo knife, hammer, and bat. Chucky has rooted hair and an angry expression. Push the button and he speaks key movie lines like: ?Hi, It?s Chucky, Voodoo Chant, Evil Laughter, and More! ?